In a large soup pot or dutch oven, saute the chicken, peppers, and onions for about 20 minutes until lightly browned. Stir in the garlic and spices and cook 2 more minutes. 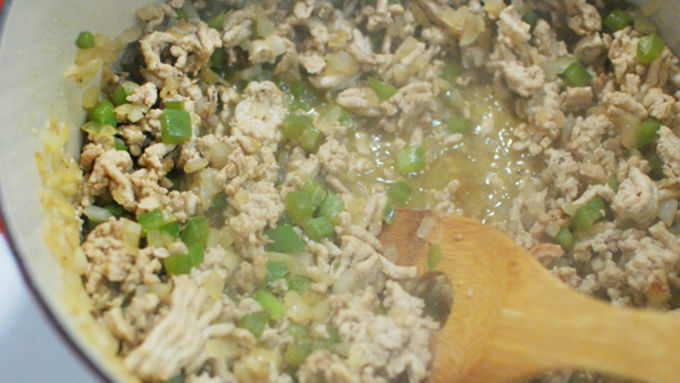 Stir in the canned tomatoes, green chiles, and chicken broth. Bring to a simmer. Peel the plantains and drop them into the simmering soup. Cook 15-20 minutes, depending on how ripe they are, until tender. Remove them from the soup and add to a mixing bowl. Stir the dried cranberries and kale into the soup and continue to simmer. Mash the plantains and add the egg and flour to the bowl. 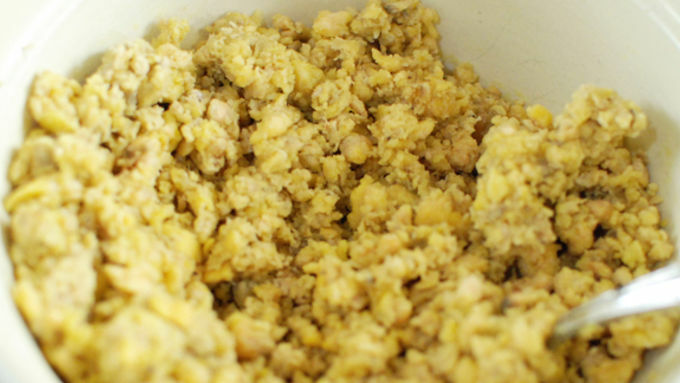 Mix well and add as much oil as you need until the mixture can come together and hold a dumpling shape. Depending on how ripe they were and how much moisture they have this could take as little as a splash or even over a 1/4 cup! 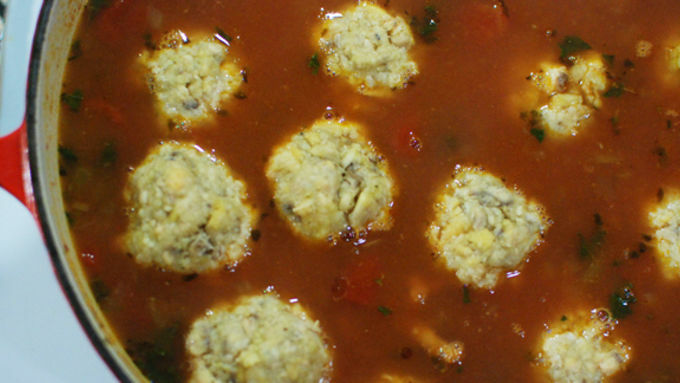 Form the dumplings into meatball sized balls. Drop the balls into the simmering soup. Simmer about 20 more minutes until all the flour is cooked. Stir the soup gently to mix and serve! Make sure to give everyone a couple dumplings in each bowl. Sometimes called Caldo de Bolas, this Chicken Dumpling Soup with Plantains is unusual – and unusually good! Every time I cook with plantains I think, "Why don’t I cook with plantains more?" They're so versatile, can fit anywhere you use potatoes or squash, and add a unique tropical component to any dish. Not only that, but plantains are practically two completely different ingredients – depending on if they're green or yellow. 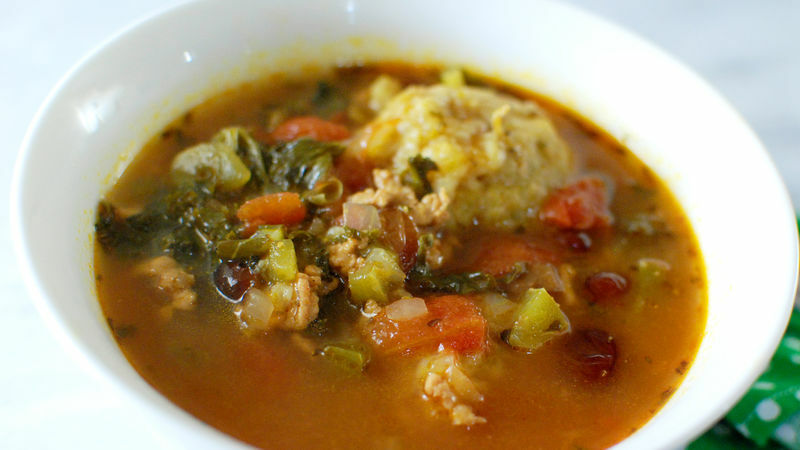 In this dish, I used the plantains in a dough mixture to make some flavorful dense dumplings to go in a sweet, sour, and savory soup.The soup was loaded with everything you want to eat right now, like a warming broth, dried cranberries, and chunks of chicken and veggies. The plantains also added a natural thickness to the soup and made it almost chili-like in texture. 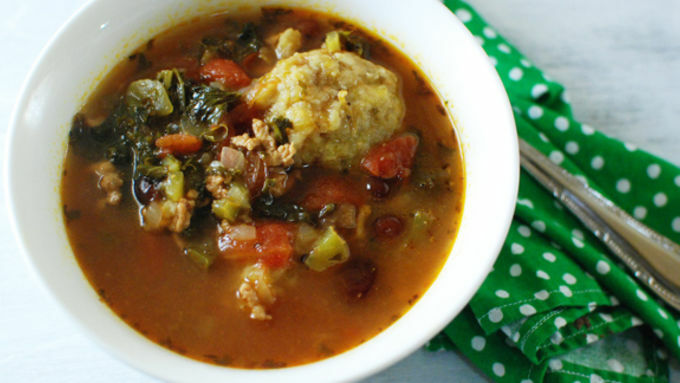 Try this soup on the next cold fall evening; you won’t be disappointed! Stir it all up before serving. 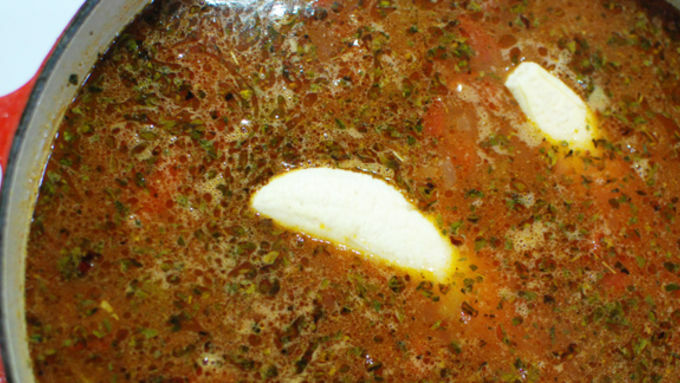 This soup is fantastic and the recipe makes enough for a group to enjoy, but you should have enough to bring to work the next day too. With spicy, sweet, sour, and savory elements, this is the perfect soup on these cold fall evenings. And it's hearty enough that you won’t be hungry in a few hours!